The day began with a presentation from Maryland’s Assistant Secretary of Resource Conservation Hans Schmidt. Schmidt shared an update on the current progress and status of Maryland’s Nutrient Reduction Strategy for the Chesapeake Bay, which was formalized in 2009 with the establishment of Total Maximum Daily Load (TMDL) nutrient level monitoring and enforcement for the watershed. “We have to make this final push to 2025 if we’re going to meet our reduction goals,” Schmidt shared. 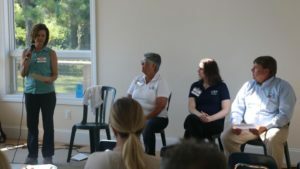 Conservation Technology Information Center (CTIC – West Lafayette, IN) recently hosted its annual Conservation in Action Tour in the historically-distressed Chesapeake Bay watershed, with stops in and around Maryland’s row-crop farm dotted Eastern Shore. Welcoming the group at Tuesday evening’s opening night reception in the lavish Westin Annapolis ballroom, Terron L. Hillsman, Ph.D, who began his career with the USDA Soil Conservation Service in 1992, helped set the stage for the next day’s tour and the overarching theme that pervades everything Maryland agriculture, as tour attendees would soon learn: Partnerships. As stated earlier, CTIC’s Chesapeake Bay tour focused primarily on Maryland’s Eastern Shore, where the majority of the state’s row crops (corn, soybeans, and winter wheat) are produced. The state itself is broken up into 24 soil conservation districts, and growers producing a crop in the Old Line State within the Chesapeake Bay watershed (and elsewhere) are governed by Total Maximum Daily Load (TMDL) nutrient regulations and extensively reviewed nutrient management plans that must be approved by and filed with the state department of agriculture, among many other farm nutrient-focused laws and regulations. 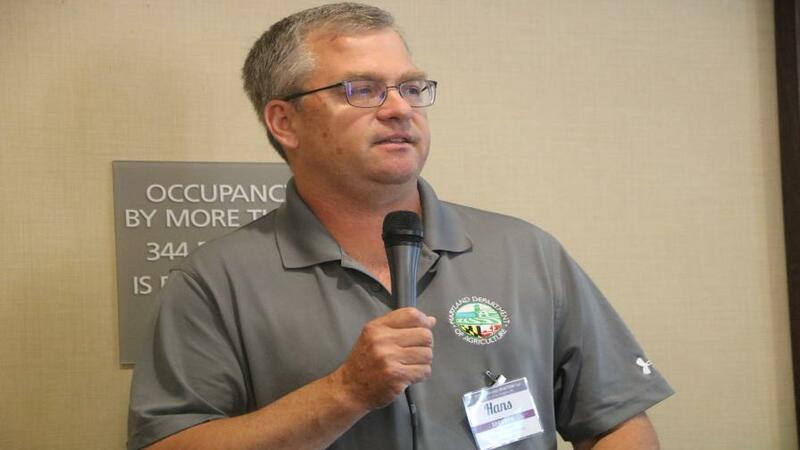 Not all is doom-and-gloom, however, as the state does take a progressive approach in offering cost-share programs for producers for cover crop plantings and soil sampling costs. All of this cooperation among farmer, regulators, environmentalists, and trusted advisors in the watershed seems to have paid off. Overall tons of nitrogen that have made their way into the Bay have been reduced from 1985’s 28,340,000 annual metric tons to 17,539,000 in 2017. 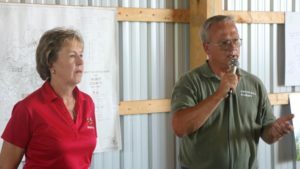 “Ag has really made some great strides in this state in reducing nitrogen and phosphorus to the Bay,” Hans Schmidt, farmer and Maryland Department of Agriculture Assistant Secretary of Resource Conservation, told the group as it finished up breakfast and prepared to depart for the day’s festivities. The day’s first stop off was just over the Bay Bridge in nearby Cordova, MD, at the Chesapeake Bay Environmental Center. There the group heard from its first panel discussion of the day, highlighting one of the more unique partnerships that is bubbling up: farmers and aquaculturists. Johnny Shockley, founding partner, Hoopers Island Oyster Co., and Julie Reichert-Nguyen, fisheries scientist, Oyster Recovery Partnership, both shared how their respective organizations are participating in research as well as interacting with actors across traditional agriculture to ensure improved water quality throughout the Bay. Keystone oysters have proven particularly useful in that regard as a kind of “biotech weapon” in the fight against nitrogen and phosphorus, as the mollusk naturally acts as a sort of N, P, and even blue-green algae filtering mechanism throughout the region. Frederick County, MD, farmer Belinda Burrier also addressed the group as part of the panel, sharing how she and husband Dave Burrier’s embrace of precision ag technologies have actually made the water they discharge from farmlands cleaner than what’s in the Bay already. “And it’s just shown a really good increase on our yields,” she added. Jenny Rhodes, Agriculture and Natural Resources Educator, University of Maryland Extension, and grower Chip Councell addressed the group. The day’s first farm stop got underway at Councell Farms, a Talbot County retail produce market and grain farming operation in the Cordova area. A plethora of conservation practices (saturated wetlands, buffer strips, grass waterways, filter strips, etc.) 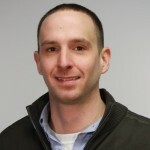 as well as precision ag technologies (GPS section control, variable rate fertility and seeding, split and in-season nitrogen application), along with a 20-year history of cover crop implementation, has seemingly positioned Chip Councell at the forefront of nutrient management in the Chesapeake Bay area. “I truly believe that technology and partnerships are the key to solving our water quality issues in the U.S.,” Councell told the group. Fourth generation farmer Bobby Hutchinson gave some historical perspective on the farm’s history of conservation practice implementation, being one of the original three brothers that founded Hutchinson Brothers Farm. Next up was another on-farm visit, this time being Hutchinson Brother’s Farm, where the group saw a more diversified operation where corn, soybeans, and wheat are grown in sandy soils alongside vegetable crops such as peas, lima beans, and cucumbers (the group seemed rather transfixed by Hutchinson’s mechanical cucumber harvester). 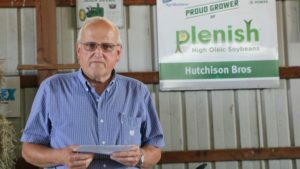 With fourth and fifth generation Hutchinsons still deeply involved in the day-to-day operation of the farm, the group got to hear a good deal about the past and present history of nutrient stewardship efforts during the visit. Kyle Hutchinson addressed the group first, discussing how he and his trusted-advisers from local ag retailer Willard Agri-Service use precision ag technologies like sprayer-mounted Greenseeker sensors and Agronomic Technology Corp.’s Adapt-N Nitrogen Modeling suite to guide variable-rate, split application nitrogen applications. Hutchinson’s father Richard, who alongside brothers Bobby (pictured right, still farming) and David started the farming partnership in 1967, was an original founding member of the local county soil conservation district, so its safe to say Hutchinson’s were some of the area’s earliest adopters of conservation practices across the acre. Maryland agriculture in total accounts for some 12,300 farms across 1.6 million acres. Crop Breakdown: 400,000 acres of corn; 515,000 acres of soybeans; 260,000 acres winter wheat. Maryland has consistently been on the forefront of conservation agriculture for improved water quality: the state’s 1987 Chesapeake Bay Restoration Agreement targeted a 40% reduction in nitrogen and phosphorus entering the watershed at the time. Maryland Governor Larry Hogan’s administration has pledged a total of over $4 billion in funds to clean up the watershed since taking office. As of press time, partners that include federal, state, and local agencies have allocated a total of $22.5 million in cost-share funds to drive Maryland farmer adoption of cover cropping systems. 924,000 acres of Maryland agricultural lands are managed under a current soil conservation and water quality plan. 800,000 acres of crop land within the state itself are in current compliance with state nutrient management regulations. Since 1985, total tonnage of nitrogen applied within the watershed has been reduced from 74,000,000 tons to 40,000,000 tons in 2017.